Over 300 million people worldwide rely on the desalination of seawater for their daily water needs, even though it is an energy-intensive and expensive process. But what if you could use desalination to make energy instead of consume it? A research team from Singapore has done just this, designing a prototype solar-powered reactor that converts seawater into clean drinking water and hydrogen fuel. Desalination is up to 10 times more energy intensive than obtaining drinking water from local fresh water supplies, but in dry coastal regions it is a necessary option. Current methods involve heating water under vacuum to evaporate and distil clean water, or reverse osmosis, which involves driving pressurised salt water through an ion-blocking membrane. If we could desalinate seawater at a lower energy cost, our oceans could become an almost infinite source of clean water, as they contain 97% of the world’s water. Ghim Wei Ho and her team at the National University of Singapore have developed a new material which could reverse those energy costs. Their nanocomposite consists of silver nanoparticles suspended in tiny particles of silica, all coated in a titania shell. They carefully designed this elaborate morphology to take advantage of the properties of each component and synergistic effects between them. The outer titania shell is a photocatalyst which absorbs higher energy UV photons to split water molecules into oxygen and hydrogen gas. Lower energy photons are not absorbed by titania and pass through to be absorbed by the silver nanoparticles. This generates heat by the photothermal effect, which not only drives steam generation, but also increases the rate of hydrogen-generating reactions on the surface. The nanoparticles act as nucleating points, so steam can form well below its normal boiling point. Ho is excited about the synergy between photocatalytic and photothermic properties. 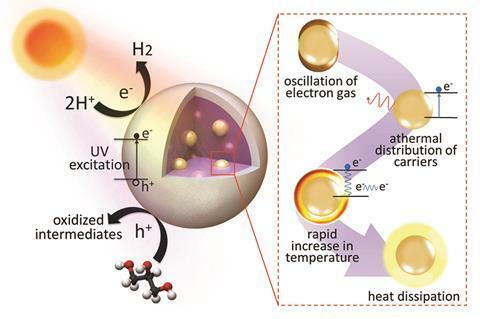 ‘This work defines the forefront of plasmonic photothermic technology, which is vastly untapped and has broad implications in other fields.’ Her team have already built a prototype solar reactor which, when filled with seawater seeded with the new material, condenses the resulting steam into clean water and collects the hydrogen separately. A very interesting article. I hope further development of the new material will produce a useful system for sea-water purification and fuel generation.